FDA Says Kind Bars Are Unhealthy, Kind Bars Say "Get Off Our Nuts"
Kind bars, the go-to snack for the more health-conscious among us, have a problem: They may not be all that healthy. The Center for Food Safety and Applied Nutrition, an arm of the Food and Drug Administration, recently sent Kind Snacks a strongly worded letter March 17 (posted by the FDA Tuesday) warning the company that four of their snack bars violated FDA labeling regulations and highlighting concerns of correct labeling of fiber, antioxidants, protein and the lack of trans fats. Chief among the infractions were the use of "healthy" and "plus" on the labels. According to the FDA, the bars don&apos;t meet standards for being called "healthy," nor do they meet the requirements for a "plus" product. "Healthy" food has less that a gram of saturated fat, among other things, while "plus" food must contain nutrient levels at least 10% higher than what&apos;s recommended. 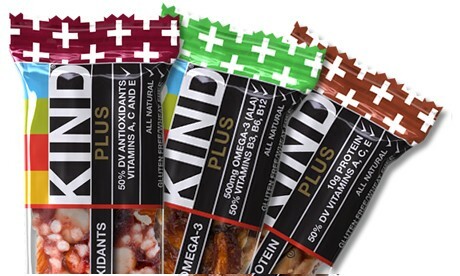 Kind Snacks fights back: A letter from the FDA calling BS on your company&apos;s claims of being "healthy" is inherently bad for business, particularly when your company markets itself that way. It&apos;s unsurprising, then, that Kind Snacks immediately went on the defensive. In a blog post published the same day the letter went public, Kind said that "we&apos;re working now to bring all items to compliance," but also dropped a bit of knowledge/sass about the saturated fat violation. "Nuts, key ingredients in many of our snacks and one of the things that make fans love our bars, contain nutritious fats that exceed the amount allowed under the FDA&apos;s standard," the post said. "This is similar to other foods that do not meet the standard for use of the term &apos;healthy&apos; but are generally considered to be good for you, like avocados, salmon and eggs." Joe Cohen, senior vice president of communications at Kind Snacks, provided further clarification, telling the Huffington Post, "Nuts do contain a small amount of unsaturated fats. The saturated fats in our bars come from a mix of ingredients nuts, coconut or palm oil." In other words, while some Kind bars may contain more saturated fat than what the FDA considers healthy, the company argues that this saturated fat comes from a healthy source — meaning they&apos;re not that bad after all. The Huffington Post also spoke with Dr. Walter Willett, chair of the department of nutrition at Harvard&apos;s T.H. Chan School of Public Health, who threw a bit of kindness the company&apos;s way. "It&apos;s a bit ridiculous that saturated fat from nuts should be counted against a product, because nuts are about one of the healthiest choices you could possibly make," he told the Huffington Post. "This is an example of something with good intentions based on concepts that are hugely obsolete." In an email to Mic, an FDA spokesperson declined to comment further on the letter. Kind Snacks did not return a request for comment. So what&apos;s really going on? The FDA&apos;s letter didn&apos;t specify where exactly the saturated fat content came from, which it makes it a bit more difficult to figure out who the consumer should listen to. Nuts are one thing, but as Willett told the Huffington Post, "we wouldn&apos;t want to see a product loaded up with palm oil." At the end of the day, however, the debate seems to be about marketing more than anything else. Kind Snacks noted that they won&apos;t be changing any recipes — just the way they&apos;re described on the label. April 15, 2015, 6:00 pm: This story has been updated.